NETWORK FINALS: FOX’s UFC telecast gained 0.1 in final numbers, while NBC’s NHL PLAYOFFS game and ABC’s run of THE 10 COMMANDMENTS fell the same. CABLE HIGHLIGHTS: ESPN’s NBA PLAYOFFS games dominated Saturday cable at 1.20/1.19/1.01 (led by San Antonio vs. Memphis in primetime). Note that HBO, following its usual practice, designated the TV premiere of SUICIDE SQUAD as an “original,” and it scored an impressive 0.92. Adult Swim had another strong Saturday late-night, with SAMURAI JACK steady at 0.66, DRAGON BALL Z down 0.04 to 0.45 (the primetime edition rose 0.09 to 0.35) , 2 episodes of JOJO’S BIZARRE ADVENTURE at 0.42/0.36 compared to last week’s 0.39, MOBILE SUIT GUNDAM down 0.04 to 0.26, HUNTER X HUNTER down 0.03 to 0.33/687K, NARUTO steady at 0.26/562K, and GHOST IN THE SHELLdown 0.02 to 0.25/510K. A&E’s LIVE PD ticked up to 0.43. On BBCAmerica, the season premiere of DOCTOR WHO arrived at 0.32, CLASS premiered at 0.19, and the season premiere of THE GRAHAM NORTON SHOW was at 0.07. HGTV’s HOUSE HUNTERS RENOVATION fell 0.09 to 0.26, and lead-out MOUNTAIN LIFE was at 0.30/0.25. Spike’s COPS returned at 0.27, with lead-out JAIL BIG TEXAS at 0.22. On Food Network, PIONEER WOMAN slipped 0.03 to 0.26, KITCHEN AT FN gained 0.02 to 0.23, and VALERIE’S HOME COOKING was down 0.03 to 0.16. On History, COUNTING CARS was at 0.25/0.24 compared to last week’s 0.28/0.28. OWN’s IYANLA FIX MY LIFE returned at 0.23, and THE BOOK OF JOHN GRAY premiered at 0.14. ID’s MURDER COMES TO TOWN fell 0.05 to 0.23. 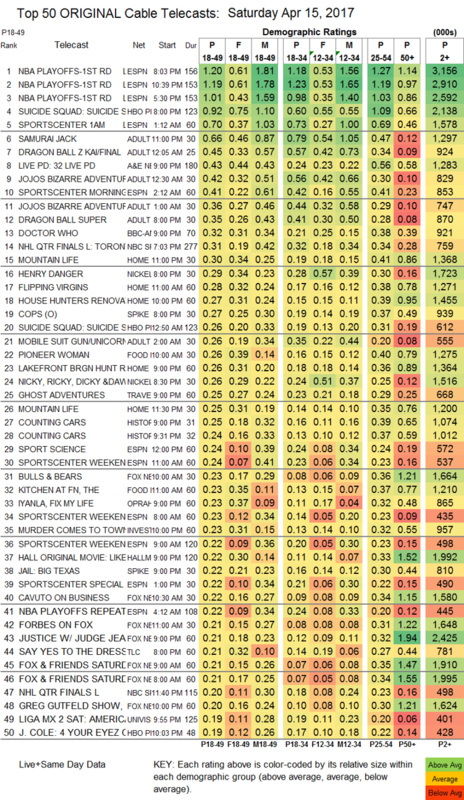 TLC’s SAY YES TO THE DRESS climbed 0.02 to 0.21. AMC’s THE SON dropped 0.02 to 0.17.